Product information "E-Revo 2.0 Screw-Set V2A"
High quality screw kit for the Traxxas E-Revo VXL Brushless (86086-4) (358 pieces), to replace all standard screws of your RC model. 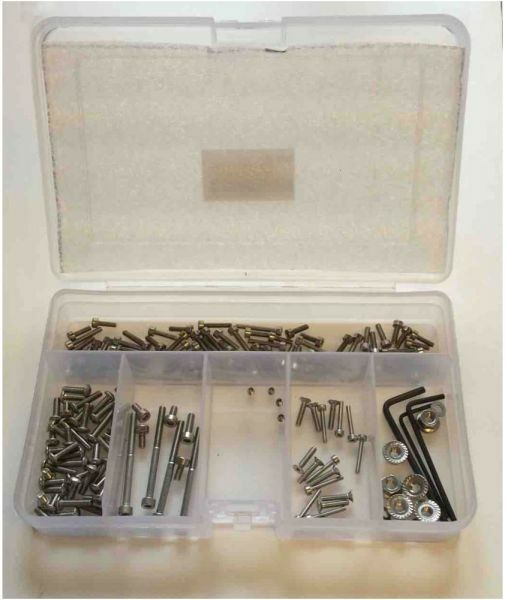 Our screw kits are exactly assorted according to the manual. We are putting the kits together out of over 300 different screw types we have in stock. The screws we use are manufactured according to the DIN or ISO standard. Sizes are M2, M2.5, M3, M4, M5 and M6. Additionally we provide lock, flanged and normal nuts and washers to optimally assort every kit. All kits include at least 40 - 50% more screws than are contained in the model. Never again search or rebuy single screws ! Related links to "E-Revo 2.0 Screw-Set V2A"
Customer evaluation for "E-Revo 2.0 Screw-Set V2A"